FAYZABAD, Badakhshan, Afghanistan, March 1, 2012 (ENS) – Counting sheep in Afghanistan’s Badakhshan province may be difficult, but shooting them is easy enough when the weapon of choice is an AK-47. The Marco Polo sheep, named after the 13th century Italian explorer who first described this region for the western world, is considered one of the fastest and smartest of game animals. Its meat is delicious and its curved horns can grow to 160 centimeters (63 inches). Killing the species is now prohibited. For 18 years before the Soviet invasion of 1979, hunting of Marco Polo sheep was carefully regulated, with foreign hunters allowed only one shot at the animal, which stands almost a meter (39 inches) high and often weighs up to 130 kilograms (285 pounds). The sheep, known locally as “nakhjipar,” are found in Afghanistan’s northeastern Badakhshan province, in the narrow Wakhan Valley corridor between Tajikistan and Pakistan. According to a survey conducted by the Badakhshan provincial agriculture department, there were 4,000 Marco Polo Sheep in 1971. A survey completed in May 2011 by the American-based Wildlife Conservation Society, using advanced camera traps placed at several locations in the Wakhan Valley, put the number at 1,500. That figure is seen an improvement for environmental protection. 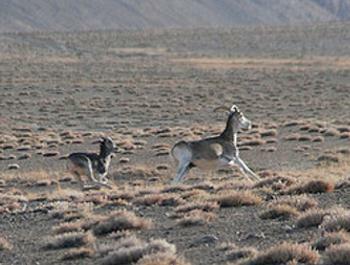 In 2009, Dr. Mohammed Shafi, head of the veterinary division for the provincial agriculture department, estimated the population of Marco Polo sheep at as few as 220, in a survey conducted in cooperation with WCS that relied mostly on photos, hoofprints and other traces found by a combined team of six Afghan and foreign surveyors. What is undeniable is the cultural change in the hunting of Marco Polo sheep over the past 30 years. From 1961 to 1978, the rules for hunting the animal were administered by the country’s tourism department. Every year, hundreds of foreign tourists visited the Wakhan Valley, bringing thousands of U.S. dollars in guide fees and tax receipts to the impoverished region. Abdullah, now 60 and living in Bokowi village, is one of six officials who were responsible for accompanying foreigners in those days. “Each tourist and foreign hunter was permitted only one shot at a Marco Polo sheep during their visit. If they missed, they didn’t have permission to take a second shot,” he recalls. Abdul Zahir, who resides in Panja village, began hunting professionally 40 years ago, at the age of 16. He says that after the sheep were killed and the meat was either eaten or preserved, the skins and horns were smuggled illegally into Pakistan and sold for as much as 5,000 afghanis. “We brought back wheat from Pakistan with the money from the horns and skins,” Zahir said. According to Zahir, in the old days hunters used British-made single-shot rifles to hunt the sheep. The Soviet invasion brought the AK-47, which can fire dozens of bullets with one pull of a trigger. The profits have also multiplied. Zahir claims to have sold a Marco Polo sheepskin for 5,000 afghanis. A three-month investigation by a reporter with the Institute for War and Peace Reporting indicates that lack of oversight by government officials, along with poverty among local people, encourages illegal hunting of Marco Polo sheep without any fear of punishment. According to current Afghan law, Marco Polo sheep are national assets, and hunting and smuggling of sheep parts are prohibited under a decree issued by President Hamid Karzai, with penalties of up to two years in prison and a fine of up to 100,000 afghanis. Local officials in Badakhshan claim that most illegal hunting and smuggling of Marco Polo sheep is organized by Pakistani dealers based in the border province of Chitral. Ghulam Nabi Sarfaraz, head of the environment department for the province, said his staff captured a Pakistani citizen last year carrying a dead Marco Polo sheep near the border with Chitral. He said the suspect was handed over to Afghan border police and he has heard nothing about the incident since. 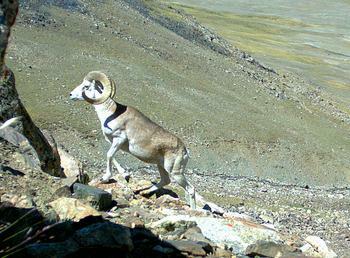 The struggle for the conservation of wildlife, including Marco Polo sheep in Badakhshan, gained ground after WCS resumed its activities in 2006, and other organizations including the Aga Khan Foundation began contributing to the effort. WCS conservationist Anthony Simms says that for the last four years, his organization has employed 40 local young people as “civil guards,” who act as game wardens to protect the sheep. Abdul Sabir, one of the civil guards, said that every week they divide into eight-member groups and go out on patrols in areas known to be used for hunting and smuggling. “We are guarding [like] police and we don’t permit anyone to hunt Marco Polo sheep,” he said. The civil guards are unarmed. Wakhan district chief Sayed Feruz Shah says poachers and smugglers are numerous, operating from the Broghil valley up to the Chinese border, an area 250 kilometers (155 miles) long and 230 km (143 miles) wide. He admits the authorities cannot provide protection for such a vast territory. “What can our government do with two policemen to cover a 250 km-long mountain wilderness?” the chief asks. 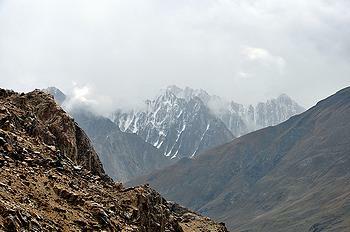 Feruz Shah noted that digital binoculars had been installed at vantage points in the Pamir mountains, along with dozens of cameras installed by WCS. But a veteran Wakhan Valley hunter who did not want to give his name said the poachers and smugglers all knew the locations of the cameras and hunted in other valleys instead. According to Feruz Shah, Wakhan has a population of 18,000 and is controlled by only a few individuals – mostly large landowners who have near-absolute influence over the hundreds of small settlements in the area. 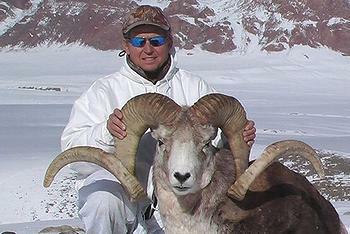 Local hunters say the landowners have a hand in the continued hunting of Marco Polo sheep. In interviews, local hunters Sabir, Abdullah and Zahir claim that large numbers of the sheep are hunted down on the orders of Wakhan’s power brokers every year for meat, which is sometimes served at elaborate picnics. Mohammad Sadiq, who has been security chief in Wakhan district for the last four years, said there are dangerous people behind the trade, a so-called “Marco Polo mafia” intent on making money. Last year, a group of three individuals was caught with a Marco Polo sheep with an injured hoof. Sadiq said the hunters confessed that the animal was to be sent to a zoo in Islamabad. “Before going on their mission, the smugglers received 100,000 dollars in advance from the Pakistanis,” said Sadiq.